This is a color picture in a frame that depicts a scene from the Wizard of Oz. In the picture is from left to right: The Tin Man, The Scarecrow, Dorothy and The Cowardly Lion. 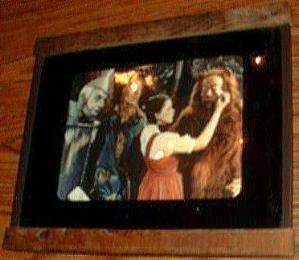 The picture shows Dorothy wiping a tear from The Cowardly Lion's face. The dimensions of the frame are approximately ~ 14 1/4 " x ~ 12 1/2 "
The dimensions of the inside picture are approximately ~ 9 1/4 " x ~ 7 1/4 "
The frame is wood on the top and bottom with a hook on the back. There are plastic brown clips on the sides to hold the picture in place. The surface appears to be plastic. There are no indications of manufacturer name or date. The inside of the plastic has been painted black and there is some paint wear on the inside. My photo image above has a few white spots which are glare that are not on the actual picture. Please include your phone number with your E-mail. ONLY E-mails with phone numbers will receive a response.